Columbus has no shortage of cozy spots for date nights. 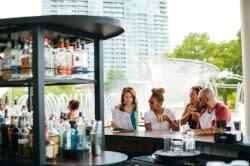 Whether you’re looking for something casual or formal, you’ll find many options offering creative and delicious food, fun drinks, and relaxed atmospheres that let you focus on your date. The Gallerie Bar & Bistro in the Hilton Downtown Columbus features the food of Chef Bill Glover. Chef Glover was invited to cook at the James Beard House in New York City in September 2015. His menu ranges from classic to creative, with items like Ohio chicken and risotto to rabbit tortelloni and short rib croquettes. La Tavola offers homemade Old World Italian meals in a cozy Grandview spot. The pasta dishes are exceptional, from the prosciutto-wrapped fettuccine to the gnocchi to the spaghetti and meatballs. And don’t skip getting one of Krista’s desserts! Natalie’s Coal Fired Pizza is a casual Worthington spot that hits all the right notes: a menu of crispy pizzas, fun cocktails, a trustworthy line-up of craft beer, and a rotation of local and national live music acts. For a date night featuring some fragrant and colorful eats, Aab India has three locations – Grandview, Dublin, and Bexley – all featuring northern Indian staples like tandoori chicken and a wide a menu of curry dishes. The Table encourages responsible dining while focusing on your dining companions around the table. Their menu rotates with the season and features great dishes for both vegetarians and omnivores alike. Feast on lamb chops and scallops, or curried chickpeas and squash gnocchi. The Refectory’s building was once the communal dining hall for a church, and today the cozy and collective feel remains. The French bistro and restaurant features a menu heavy on game meats in stunning preparations, from the simple escargot terrine or skate wing Rossini, to roasted duck, antelope and stuffed quail, or sous vide wild boar rack. The Whitney House serves up both fun and comforting foods for you and a date to explore. The pub-like atmosphere is a quiet place to cozy up with a good meal. Start with drinks and some griddled bologna or brie with bacon jam and apples, then move on to duck pot pie or trout over a purple potato hash. Trattoria Roma in Grandview offers another quiet Italian escape. Sip on wines while you enjoy house-made pastas. Enjoy the Italian lithograph collection on the walls, and order from their whiskey list for dessert. Where do you like to dine for date nights?